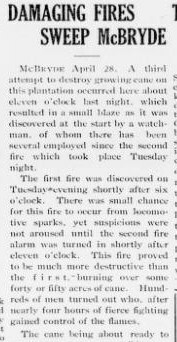 On April 28th, 1911, someone set fire to the cane fields at McBryde Sugar Plantation. The fire had been spotted early and was quickly put out. This had been the third fire on the plantation in only a couple of days. The first may have been set by sparks from a locomotive. Then, a second fire was spotted the same day. This one was larger and burned forty to fifty acres of sugar cane. After the third fire, the incidences were treated as suspicious. There were no witnesses, so no suspect was indentified. 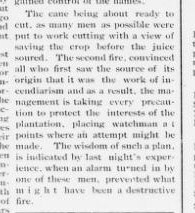 Watchmen were placed around the plantation to ward off further attempts.